Use stopwatch when you want to time yourself during work. When you start working on task, click on Start stopwatch. The Add tag dialog will pop up. 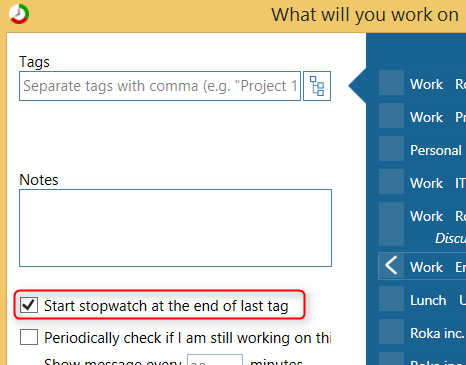 Write some tags about what you will be working on. When you click Ok, stopwatch will start running. Once stopwatch is running you can pause or stop it. When you pause it, current tag will be saved and shown in the UI. When you stop working on the task, click the Stop button. 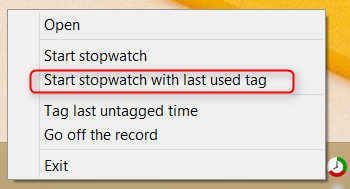 To start or stop stopwatch you can also right click on the ManicTime icon in system tray and choose Start/Stop stopwatch. 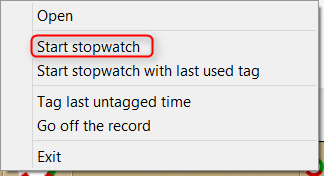 To start or stop stopwatch you can also use shortcuts which you can define in Settings.